Welcome to my website! I am a Technical Artist with an art background and 4 years of industry experience. I am passionate about building tools, pipeline improvements, and finding new workflows to help artists make content better and faster. Below are a sample of my skills as a Tech Artist. Bounce Bake is near final and I plan to release it out in the wild soon. ​The goal of Bounce Bake is to drastically reduce setup time when baking a highpoly to lowpoly asset. 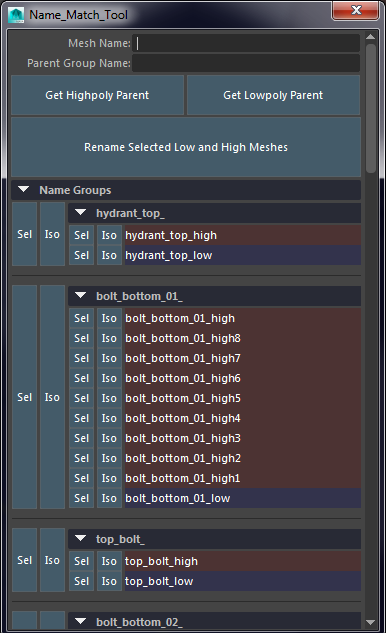 It is a streamlined user interface that allows the user to interact with Substance Batch Tools inside of Maya. The tool also saves all the bake setup information to the Maya scene so coming back to a save file and re-baking is super fast. From my tests it takes an artist about 10-15 minutes to setup, organize, export, and hook up all the parameters in an external baking program, and this doesn't even count the actual bake process. Bounce Bake cuts this setup time to around a minute and the artist never has to leave Maya to get the maps they need. Also, because all these settings are saved in each Maya file if they need to go back and redo the bake they don't need to redo any of the setup work. 1) 'Config' menu allows the user to set what the default bake settings will be globally. This is also where they can setup how the tool will organize where the baked maps will save, green channel direction, and other important global features that lets the user customize how they want to use the tool. ​'Support' menu lets the user open how to guide, readme doc, and report a bug. 2) 'Make Bounce Groups' button sets up the outliner with the group structure the tool depends on. 3) 'Make Cage' button takes all the lowpoly meshes and creates a cage mesh from them. The tool also sets up some hooks to allow for easy inflating of the cage for the adjust tools in number 6. 5) Simple toggle buttons that turn on/off the display of the bake groups. 6) After making the cage the 'Global Cage Adjust' slider will allow the user inflate all the cage meshes the same amount. If they need to make more localized adjustments they can select one of the cage meshes and click the 'Set Active Cage Mesh' button which will inflate only that single mesh. The value from the global cage cage slider is added to the active cage mesh slider to create the final result. 7) Textures and bake settings, plus the ability to set to whatever the default settings the user set in the config menu. These bake settings are stored inside the Maya file, so returning to a Maya file will load all the settings from the previous bake that was done. 8) 'Run Bounce Bake!' button will error check the bake setup and then run the bake with all the settings. The tool will export the meshes and send the data to the Substance Batch Tools process. 9) 'Update/Create Painter File' button takes all the baked maps and lowpoly mesh and sets up a new or existing Substance Painter file with everything imported. Bounce Bake is written in Python 2.7 using the Pymel library and Maya's built in UI methods. This is a proof of concept data base tool that goes through a Substance Designer library and compiles important information from each Designer file. Since Designer files are just XML trees this data base can also make batch changes to the entire library without any issues of breaking dependencies. For example, if you wanted to relocate a texture resource used in a lot of the Substance Designer files the tool can find all the references and patch all the files without ever needing to open up Substance Designer. The the tool is written in Python 2.7 using the XML ElementTree library.